According to Cairol’s facebook they’ll be a coupons for free Pantene Shampoo and Conditioners on the Pantene Facebook @ 5pm (Pacific Time) / 8pm (Eastern Time). Be sure to click here and like Sample Stuff on facebook for a reminder when this goes live. I want a free sample Please! i would love to try pantene! I just love Pantene products! Always leaves my hair smooth and shiny! Would love to try a new product. I give these to my grand daughter ! She loves getting samples too ! I love Pantene. My hair always feels so nice and silky after using it. I use the fine hair one and love it. Would love samples. Love these products. I would like a free sample please! hope to get a free bottle.. I would LOVE to have this!! I love your shampoo! Love your product and would love to have this!!! i am new to this also.i would love to have pantene. Thank you !Thank you! Thank You! I LOVE Pantene shampoo and condtioners! 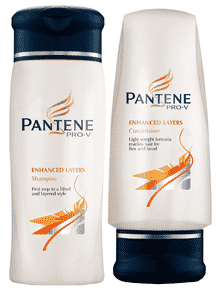 After trying many, many different shampoos I always come back to Pantene. I used to used Pantene back in the day. I used to use pantene shampoo and conditioner long time ago and it was good for my hair don’t know why I stop using it!